Learning how to grow blueberries is simple and they can provide a unique addition to our diet. Are there any other blue fruits? The incredibly high level of antioxidants in each blueberry makes it an essential fruit for longevity. This is why the northwest natives lived to become wise elders. 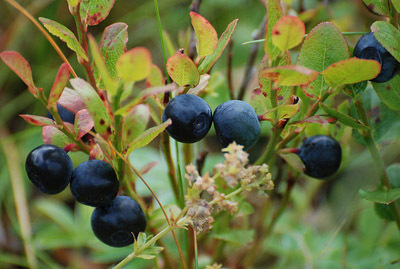 The wild blueberries and huckleberries were a staple food for them. The B vitamins boost metabolism. The minerals in each berry aid in moderating heart rate and blood pressure. Just like the unique role the berries play in our bodies, the bushes that blueberries grow upon fill a unique ecosystem niche. In the wild, blueberries and their huckleberry relatives grow on forest edges where they receive a lot of sunlight. In learning how to grow blueberries, we have to understand that different species grow at different altitudes and therefore ripen at different times of the summer and early fall. And so the blueberry (and huckleberry) is essential to the survival of many wildlife species, especially the beloved black bear. How can we apply these observations of blueberry bushes in nature to our farm and garden ecosystems? 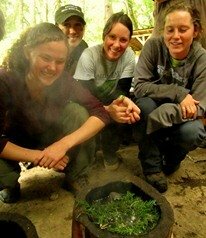 We know from studying the wild relatives that they thrive in very moist, acidic soil conditions (4-5.5 pH). They grow on edges where they receive a good amount of sunlight. They are enjoyed by animals. These observations guide us in our blueberry patch decision making processes. We place our patch in a moist, yet still well drained place that receives a lot of sunlight, possibly along the southern edge of our orchard or forest garden. We plant the plants in the fall or spring, when temperatures are mild and root growth is peaking. We plant many varieties that fruit at different times during the season for two reasons. 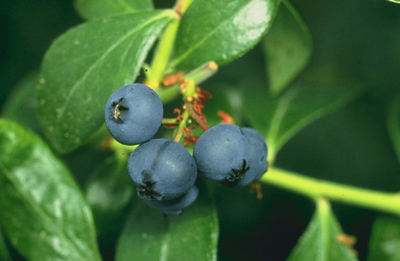 In considering how to grow blueberries, we first want to maximize pollination and therefore fruit production. Second, we, like the black bear, want to snack on fresh blueberries for longer than two or three weeks each year. We protect our blueberry bushes and (especially) their fruits from predation. Integrated Pest Management practices may be applied in the protection of our blueberry patches. Physical barriers like bird netting, deer fencing, and thorny hedgerows may be used. Providing habitat for predators (housecats, bird eating hawks and owls) will help maintain balance in the blueberry patch. We can apply some permaculture principles to maximize and diversify the yields of our blueberry patch. This is the icing on the cake, folks. For our mulch, conifer tree wood chips (inoculated with edible mushroom mycelium!) work beautifully to maintain the low pH of our soil as well as retain moisture during the dry months. When we are thinking about how to grow blueberries in our garden, consider the habit of the blueberry bush is to clump, we can grow low, running groundcover plants (like lingonberries, emerald carpet, or wild strawberries) at the base of each bush in our patch. Another product that a mature blueberry bush contains is durable wood. Shoots from the base of the plant often grow up into the center of the bush. They often crowd the center of the bush and impair ventilation. This problem is turned into a solution by making an arrow shaft out of the thin, straight shoot! The pruning cuts can also be used in asexual reproduction through softwood cuttings. Blueberries are fantastic fruits and bountiful bushes. They produce reliably and are easy to grow. They are beneficial to both our bodies and the ecosystem, whether it be in the wild or on the homestead… or perhaps the wild-homestead!